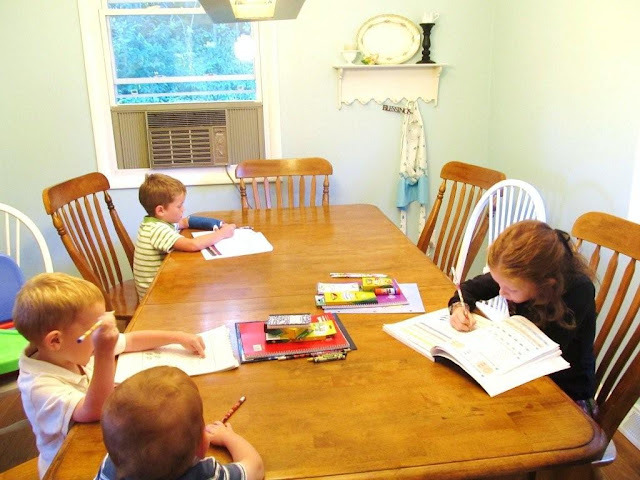 One morning last year, I was feeling extremely passionate about being a homeschooling mom. The dishes were done, school was fully in process, the sun was shining, and I'm pretty sure birds were sweetly singing on the windowsill. We were sitting at the table when Emilia shattered our homeschool utopia. "I really want to go to school." Two of my boys, Jonny and Matthew, chimed in that they really wanted to go to school as well. Immediately a cloud covered the sun and the birds ceased their melody. Completely deflated, I wanted to know why they desired to attend school. Emilia wanted "Show and Tell" (thank you Fancy Nancy), Jonny wanted recess, and Matthew...well, he just wanted to do what his siblings were doing. I tried to explain that school is much more than show and tell and recess, but to no avail. They still “really!” wanted to go to school. My homeschool passion fizzled, and I was consumed with nagging concerns. Will the kids resent us later because we homeschool? Every kid gets to have recess and show and tell...(starting to panic)...We're not letting them be NORMAL!!! By the time my husband got home, my energy was completely sapped. Sluggishly, I put together a dinner of buttered noodles, cheese, and leftover raspberry jello (I never said I was a gourmet cook, but this meal was bad). In despondent tones, I told him what had transpired earlier. He just smiled and looked at each child as he said, "Your mom and I think that homeschooling is the best way to educate you right now. Let's eat!" And that was that. The kids perked up and didn't mention it again. I perked up and wished I had cooked a better meal. After dinner we had "Show and Tell". Then Nate set the timer for 15 minutes of "indoor recess". The kids played, and we were able to have an uninterrupted conversation. It ended up being a great night. In one short sentence, my husband reminded me that we made a thoughtful, prayerful decision long ago, and it wasn't going to be put asunder by the wishes and whims of our children on that particular day. It's good, every once in awhile, for us to re-evaluate (and always good to pray about) our decision to homeschool, but it's also good to rest in the decision we made as challenges within and without come up. And come up they will. So, we try to stay focused and keep plugging away.